Samsung Electronics aims to introduce a smartphone with a foldable display next year, Koh Dong-jin, CEO of the firm’s smartphone business announced Tuesday. 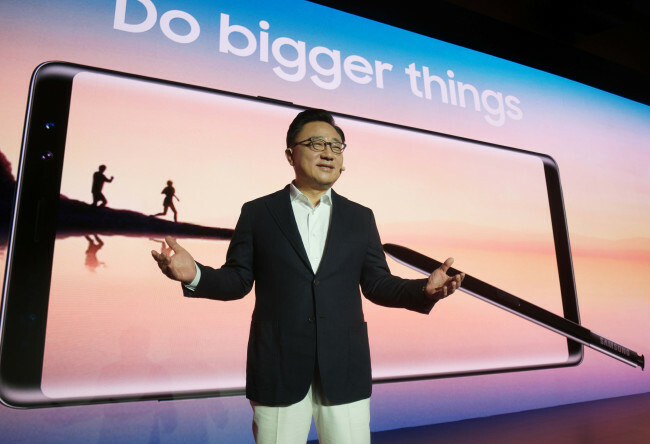 At a press conference held three days before the release of the latest Galaxy Note 8 smartphone in Korea, Koh said Samsung has clear roadmaps for the innovation of its smartphone series -- the Galaxy S and Note -- and a foldable type is to be included in one of the series. “We will launch a foldable device when we are fully ready, and we are aiming to do so next year,” Koh said. It is the first time that the chief of the South Korean handset maker has publicly mentioned a specific plan for the next-generation product. But which series -- the Galaxy S or Note -- will have the first foldable model was not revealed. For the past five days since preorders for the Galaxy Note 8 kicked off, the total number of preorders reached 650,000, posting a new record. By the last day of preorders, which falls on Friday, Samsung estimates the total figure would exceed 800,000, about double the preorder volume of the predecessor Note 7 smartphone last year. Samsung has set the retail price of the upcoming flagship smartphone at 1.09 million won for the 64-gigabyte model in Korea, making the Note 8 the most expensive Samsung phone so far. By setting a high price tag for the Note 8, Samsung is targeting a smaller group of consumers who have been using the Note series smartphones since 2011, such as professional illustrators, photographers and office workers. However, the ongoing move in the political circle to fully implement a handset blacklisting system may deal a blow to Samsung’s price strategy, according to Kim Jin-hae, marketing head for the Korean market. “The blacklisting system is aimed at lowering phone prices,” Kim said. “Since Samsung is a global company, it is not easy for us to adjust the price of a product for a single market. “We are concerned about expected changes in the distribution market for smartphones once the system is fully implemented,” he added. Meanwhile, Samsung’s rival Apple is scheduled to unveil the iPhone X, a 10th-anniversary model, on Tuesday, US time.